This beautiful Montreal, Quebec hotel offers easy access to all of Montreal's sights and attractions. 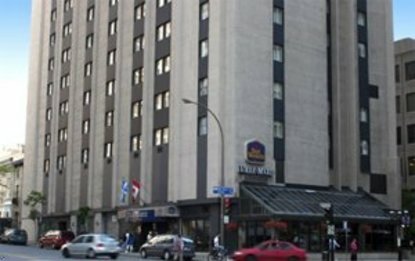 The Best Western Ville-Marie Hotel and Suites is ideally located in an upscale area of downtown Montreal, Quebec. Guest enjoy convenient access to the underground shopping, museums, theaters, world-renowned restaurants and night life, all while overlooking Montreal's famous Mount Royal. Hotel guests will also be steps away from Montreal's main business centers, fabulous entertainment and world-class cuisine. Travelers will find great appeal in the new look yet old charm found at the Best Western Ville-Marie Hotel and Suites. The hotel's 170 spacious guest rooms feature a full range of amenities at a great value. This Montreal hotel boasts banquet rooms to accommodate 12-200 people, a complete business center and state-of-the-art fitness equipment. Discover the fabulous Mediterranean cuisine in the new on-site restaurant and bar, Zawedeh. For exceptional service including a multilingual staff, make an online reservation at the Best Western Ville-Marie Hotel & Suites in Montreal today.